Escape the afternoon heat and cool off. Escape the afternoon heat and cool off at sea on a boat trip. Leave the hustle and bustle of the city centre behind, enjoy the breeze on aboard a catamaran and cool off with a swim. These 1½ hour trips are only available from May to September when the water is warm, in other months the tour is 30 minutes shorter and doesn't include a swim, see our Afternoon Boat Trip. 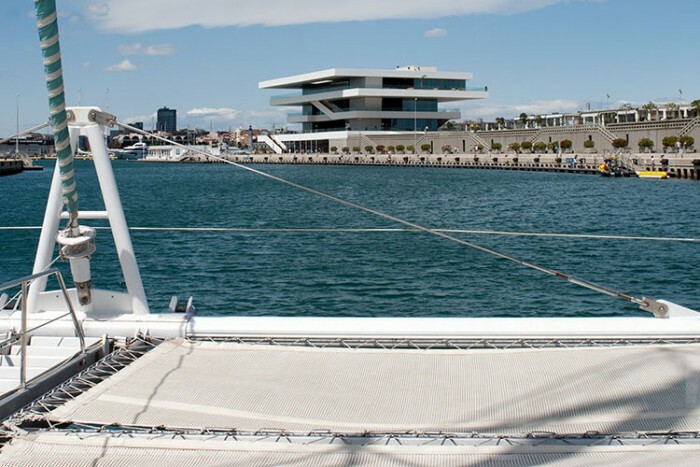 Unwind and relax as you get a different perspective on Valencia from the sea. 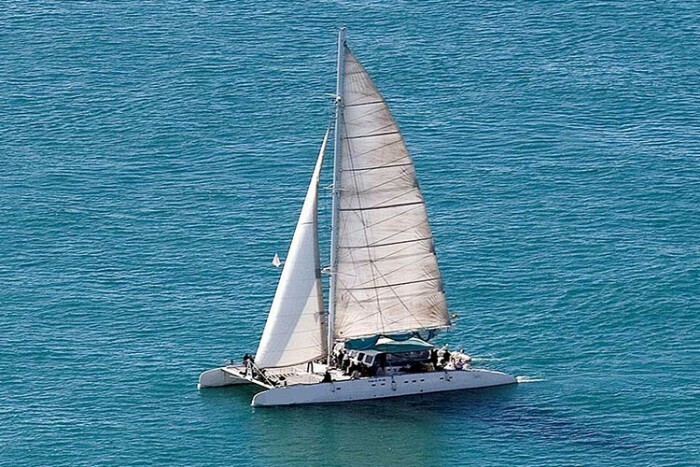 The catamaran tours are popular and can book out many weeks in advance. Don't leave it until the last minute. Book now! You'll sail along the coast with views of the beaches and the City of Arts and Science in the distance. The catamaran is equipped with a cash bar, so you can sit back with a cold drink and enjoy your time on deck. TIP! Include drinks vouchers when you book and save time and money onboard! And if all that still isn't enough, the boat will anchor and you'll also get a chance to take a dip in the cool Mediterranean waters before getting back onboard and continuing the trip. 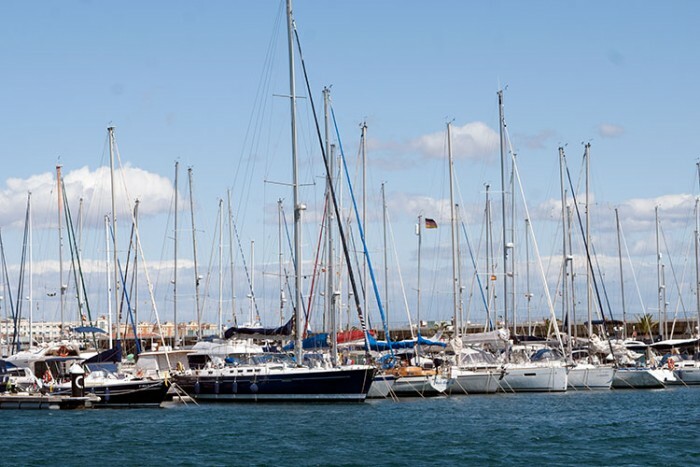 Arriving back to Valencia Marina, you can spend some time looking around the port and strolling along the beach promenade, before heading back to the city centre or staying to enjoy a delicious dinner at one of the many restaurants in the area. "Had a great time, both kids and adults. Everything was on time and according to schedule. Would definitely recommend"
"Beautiful, relaxing, original, fun. Impeccable service. I highly recommend if you have an extra afternoon in Valencia!" "Thanks for organizing in a very fast way our Valencia Boat Trip"
"Relaxing way to spend the afternoon. Enjoyed my sailing cruise. The whole experience from booking to finally boarding the boat was amazing." "To be repeated! Booked a boat trip for 1½ hours, next time we take 3 hours! For those who are in Valencia, do it for sure!" "Really, really helpful staff. Trip was good fun. Weather was perfect and the skipper was excellent"
"Amazing experience. The crew were friendly. Reserving was easy and is recommended"
"Just what we needed on a hot August day. Jump off in to the Mediterranean... it was such a thrill!! Definitely one of my most favorite things we did in the city!" "The catamaran trip was awesome. The perfect activity for a Friday afternoon in the sun"
"An amazing experience! Would highly recommend!" 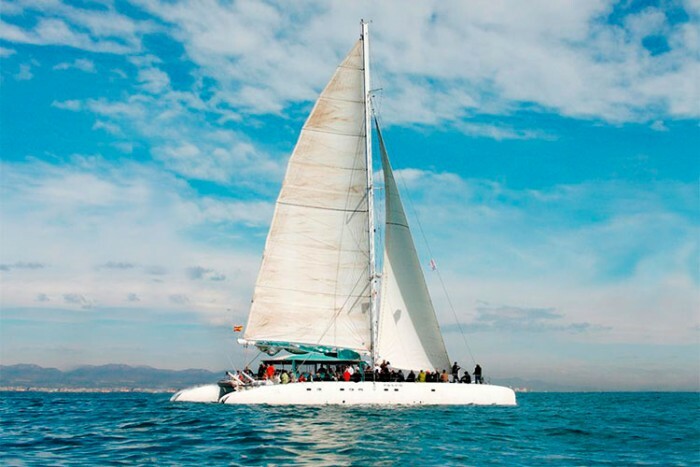 "The catamaran trip we booked was perfect"
May-Sep, 4:30pm (meet 4pm). Mon, Tue, Thu, Fri, Sat, Sun, depending on time of year, see schedule. Drink vouchers are available when you book to save you time and money at the bar onboard. Vouchers for 5 beers/sangrias/soft drinks cost €12. Other drinks can be purchased onboard with cash. 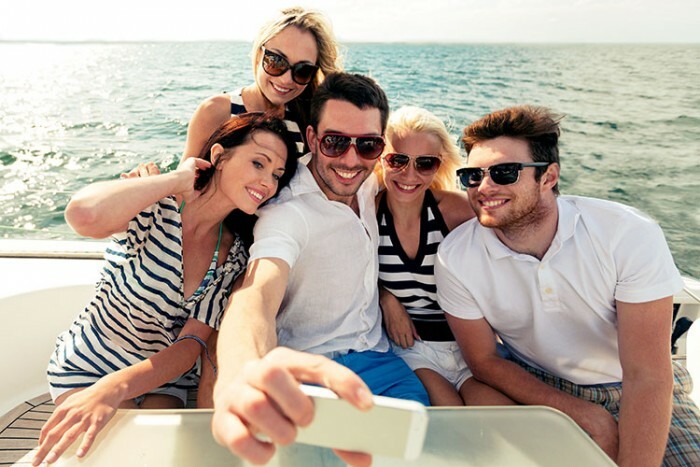 1½ hour boat tour with onboard bar service to buy drinks. Stop for a swim (conditions permitting). Drinks (unless you purchase vouchers at time of booking). Boat tours are dependent on the weather. The tour goes ahead rain or shine, as long as the captain considers it safe to do so. It is your responsibility to check the weather and bring suitable clothing. Bear in mind in can often be cooler at sea than on the land. 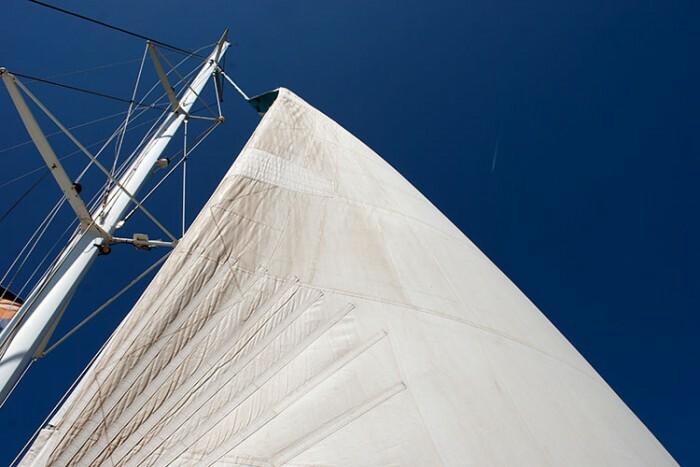 The captain will only use the sails if the wind is suitable, otherwise you will sail with the motor. While the seas are typically calm, we recommend that those prone to seasickness, take motion sickness medication at least one hour prior to departure and refrain from drinking alcohol during the trip. The stop for a swim will only go ahead if the conditions permit. The meeting point is in the north part of Valencia Marina (Marina Juan Carlos I). This is about 20 minutes in taxi from the city centre, the fare is usually under €10 in each direction. 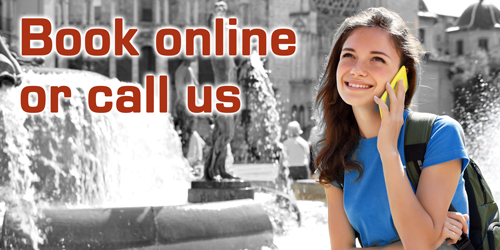 You can also get there by metro/tram or bus in about 30-45 minutes. Detailed directions along with a map and photo of the meeting point are included with your E-ticket. Date not available below? See our full catamaran tour schedule to find all departures for the dates you're here. In the cooler months this trip is available here without a stop to swim.